The 21 February 2016 was the beginning of something new. The very first registered litter of STANDARD PARTI-POODLES was born. The was a combined effort of Elizabeth Chambers of Trevasco Poodles and ourselves at Shertonah Manor. With the import of Shertonah Wind of Change (IMP USA) and Trevasco Hannah At Blythswood (IMP USA), both solid coloured standard poodles - both carrying the parti-coloured gene - which is known as being parti-factored. Statistically, we were expecting only 25% of the litter to be parti coloured. We got so much more than we bargained for. We not only had the parti-coloured poodles we also ended up with brindle and a very gorgeous phantom girl. We wont be having another parti-coloured litter for some time. The gene is recessive and requires two copies to produce an affected dog. Most of my dogs are solid and do not carry the parti gene. However, Elizabeth Chambers of Trevasco Poodles (http://www.trevasco.com/) has done a repeat mating of this breeding. I've put my hand up for a brindle parti-coloured dog. Fingers crossed we get one. Due to current registration restrictions imposed on coloured poodles, the Parti, phantom and brindle cannot be put on main registration for breeding or showing. Who guessed this litter wide eyed girl would turn into this gorgeous girl? Parti-coloured poodles are recognized in poodle history as the original colouring of the poodle. A parti poodle has solid-coloured patches over a white coat. The coat will usually be white and colored in equal amounts, though it can vary with a larger percent of white. Registries prefer that parti poodles have the same points as its correlating solid-colored descendants. Brown and white parti poodles have liver-colored noses, eye rims and lips, dark or self-colored toenails and amber eyes. This is also permitted, but not preferred, in apricot and white parti poodles. Black/white, Blue/white, and silver/white poodles have black noses, eye rims and lips, black or self-colored toenails and very dark eyes. When the dog has markings that resemble those of a tuxedo, it is called a "tuxedo" poodle. 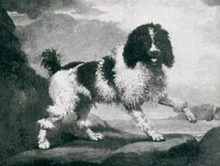 The upper coat is solid: head, back, tail; and the lower coat is white: neck, chest, abdomen, and legs, The Poodle has a wide variety of colouring, including white, black, brown, parti, silver, gray, silver beige, apricot, red, cream, sable, and patterns such as phantom and brindle. The AKC recognises Poodles in either solid-colored or parti-colored coats. Recognition of particolor (spotted) Poodles varies by registry. Phantom, brindle, and sable are considered out of standard by all major registries. Recognised FCI colourations are black, white, brown, gray, apricot, and redmaking up usually 40% or more of the coat. The origin of the poodle is disputed. Encyclopædia Britannica traces the origin of the poodle in Germany where it was known as the Pudelhund. The word Pudel is derived from the Low German verb meaning "to splash about", and the word Hund (dog). The Fédération Cynologique Internationale holds that the poodles descends from the French dog Barbet and might have been crossed with the Hungarian water dog. The breed was standardized in France, where it was commonly used as a water retriever. The French name Caniche comes from the word cane (the female of the duck) since this type of breed was used as a water retriever mainly for duck hunting thanks to its swimming ability. Due to the breed's popularity in France, it became established as its national breed. FOR MORE INFORMATION PLEASE REFER TO THE FOLLOWING WEBSITES.